RxPG :: View topic - How to fix RxPG IM popup window sizes in Firefox browser? especially with the new 3.0a5pre version. This is how we fix it..
3. Scroll down the list till you find the entry. 4. If the entry reads �false�, double-click the line. The value should change to true. I dont know how to make it open in a new tab. right click any pop up, see page info, paste that in new window. Bookmark it if you want. The numbers at the end is the period the messenger would autorefresh in. 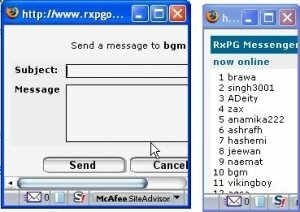 Thanks 4 the help RxPG team. Just found out that some conflicts between the firefox addons can cause change in the PopUp window size. When this happened again, i disabled all add ons & started enabling it one by one & finally found out that the extensions McAfee Site Advisor & Alexa Sparky are having some interactions with No Script or Grease monkey & thats causing the change in size. I disabled Sparky & Siteadvisor & the PopUp window size was resotred to normal. Home -> Forums -> [Help/Newbie] -> How to fix RxPG IM popup window sizes in Firefox browser?